Move a friendly creature. Then, it deals 1 damage. 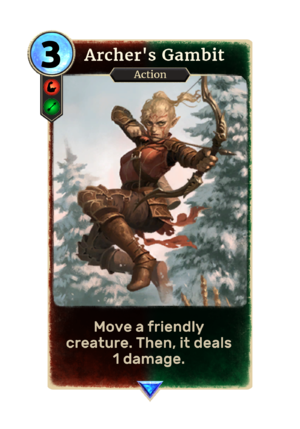 Archer's Gambit is a rare Archer action card. It is part of the Heroes of Skyrim expansion. In addition to the card's availability in the Heroes of Skyrim expansion, two copies are included in the Paarthurnax's Roar theme deck. The bow depicted in the artwork is an Elven-style bow as seen in Skyrim. This page was last modified on 24 September 2018, at 22:22.